The great thing about cruising? You get to sample lots of different places without having to pack and unpack. The downside? Your stay in a fantastic country like Denmark is way too short. Not only that, but you are doing so much and seeing so much, your blogging gets delayed till you get home. Then, if you are me, months later you start looking at photos and trying to decipher your notes only to realize how much you have forgotten. Our Viking itinerary included two stops in Denmark–a full day in Copenhagen and a half day in Alborg. For both stops, we opted to take the included Viking tours, and we were quite happy with our decision. 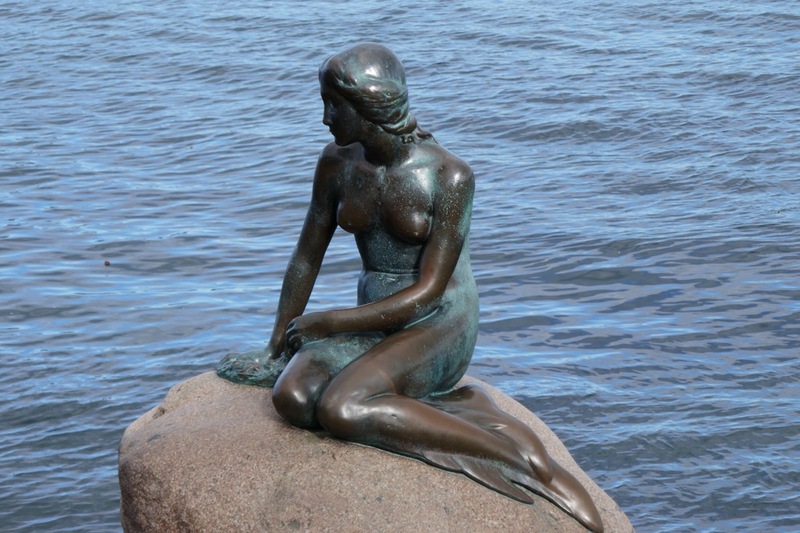 Of course, we knew we HAD to see the iconic Danish landmark, The Little Mermaid, which was within walking distance of our ship. What was surprising to me was how close she is to the shore. It was possible to climb out to join her on the rock, an impulse our guide requested that we resist. Other tourists, however, did not feel so constrained. I’m thinking that I probably shouldn’t have waited till they cleared off to take my shot. It might have been a far more amusing photo to see them cavorting alongside her. Our guide mentioned that the mermaid has a less famous sister down the road a bit, who is affectionately known as the “Dolly Parton version”. Hmmm, wonder why Walt Disney didn’t include HER in his movie? Copenhagen is a lovely city with the requisite number of palaces, towers, forts, churches and statues. Here are just a few of the images from our city tour. This horseman is surrounded by four identical buildings, all housing members of the royal family. Notice the three crowns atop the tower. If my memory is accurate (and that is a pretty big “if”), they represent the three countries of Scandinavia. A profound quote from our former president, is as relevant today as it was a half century ago. We were getting close to experiencing sensory overload, so after the tour concluded, we returned to the ship for lunch. The fortress was within walking distance of the ship and was the perfect place to spend the rest of our time in port. Who knew that a fortress could be so peaceful? Another beautiful departure, as we headed for our next stop: Aalborg. (One of) the great things about your blogging is that a little gift arrives on Christmas morning. Merry Christmas to you and yours! Thanks Nancy, and a Merry Christmas to you too! Before you know it, we’ll be in Sicily. Thanks for the kind words, Edie, And I wish you were here! I’d certainly help you with your book. When we finally travel together, it can be a joint project. An unexpected trip to Denmark on Christmas Day. Thanks! Merry Christmas to you, Marilyn. Here’s hoping we will be traveling together soon. Let me know when you will be coming to NJ again. Previous Previous post: Berlin or Rostock and Warnemunde?